What to do? What to do? There are truly endless actions that actors can take to move their careers forward but where do we begin? Many projects only occur on occasion. And others might happen weekly or monthly. However, there are a handful of tasks that should be regularly included in your day to day tasks. Here are the basics for your daily actor “to do list”. Sounds simple, right? However… few people wake up in the morning with very clear direction and strategies on how to reach their goals for the day. And many more never take the time to get clear on what their goals are in the first place. But please remember a basic rule in accomplishment…. It is very challenging to accomplish your goals if you do not know what they are. It is important to know what you want to get from your day so you are not at the mercy of your day. Once you have your goals in place, just take a quick minute or two to review them when you wake up so you have them fresh in your mind. And tackle the first tiny step towards your most important goal within the first hour of your day so you start the day strong. Budget around 20 minutes for this. Yes, some days there may be more job opportunities than others but it is important that submissions do not take up a huge chunk out of your “Actor Hours”. Actually time yourself so it does not take you hours and hours. Computer time can easily turn in to hours of nonsense if you let it. So learn to read fast, make submissions fast, and move on with your day. This includes your personal website, your contact database, Twitter, Facebook, etc. Again, the key is to do a little each day. And again, time yourself so it does not take up your entire day. You might want to plan to email 5 new producers daily. OR post an update on your site, Twitter, and Facebook… The key to this is to do a little each day so you do not become overwhelmed. And do not spend all day on Twitter and Facebook on cat videos, but to use it for your career. (Remember, it can get very easy to get distracted in cyber-space. You might want to look into a service like http://hootsuite.com/ that posts on all of your sites at the same time so you cut your work down considerably. Just as an athlete works out daily, actors need to work on their craft daily. If an actor only acts a couple times per month, they might not be as prepared as their competition that acts daily. Just makes sense. 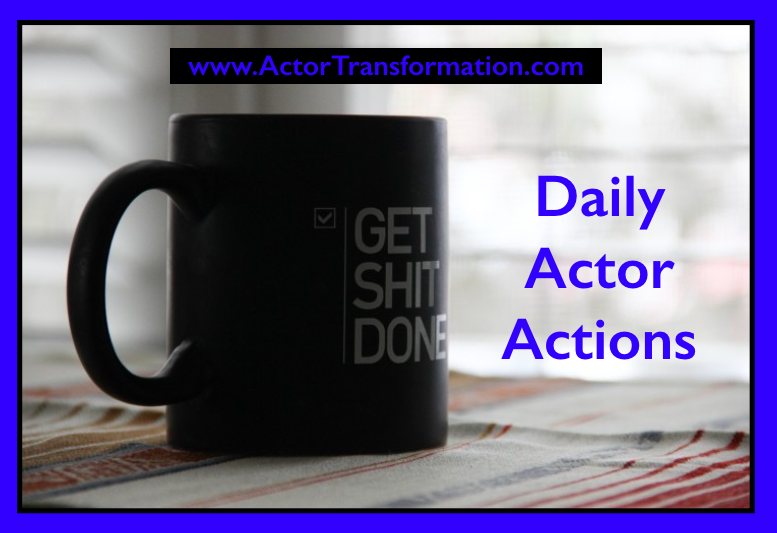 Of course getting paid to act on set or on stage is the ideal way to get in your acting quota, but since the vast majority of actors are searching for their next job at any given moment, we need to find alterative ways to act daily. If you are not getting paid to act today, make sure you are still doing something to keep sharp. This can be everything from taking acting classes, to rehearsals, to auditions, to working on scripts with friends. If your class budget is limited, you should be at staged readings, analyzing great performances in film and tv, and just plain picking up an acting book or working on scenes by yourself. There is no longer any excuse because there is an endless wealth of FREE resources and information on the web. Very simple. So simple in fact, it is very easy NOT to do. And can quite simply change your life if you actually do it. You MUST get out of your comfort zone if you want to have a successful acting career. Plain & Simple. This is one of my favorite exercises of all time because I have witnessed it work miracles…in both my own career and in countless others. What is in and out of someone’s comfort zone will be different for everyone. When someone is brand new to acting, it might make them a little nervous to do their very first shoot for headshots or the first acting class. When someone is an A-list Movie star, it might make them nervous to get up and say their Oscar acceptance speech in front of millions. Most actors are somewhere in between but still need to challenge themselves every single day. It can be making that phone call you have been avoiding. Moving up to the master level in your acting class. Producing a film starring you. Sending an email. Designing a press kit. Anything Really. If it is a positive and proactive action, yet you have been putting it off, Please take one tiny action every day that makes you nervous and notice how much stronger you are in even one month! The above are just a sampling of actions you can take, but a good balance of Biz, Craft, and Mind. So your daily tasks? Work on the business of acting, work on your craft, and work on the power of your mind on a daily basis !